RV Life is what we call it. Even though it may look like we’re tripping the light fantastic, we still endure LIFE just like everyone else. 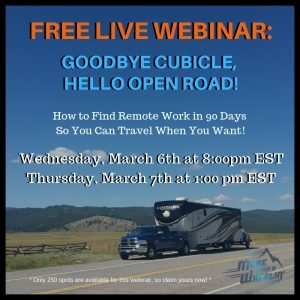 We still deal with the good, the bad and the ugly but we manage life just a tad bit differently as previous sticks and bricks homeowners because of our tiny living and travel. Even though we don’t have sidewalks to shovel or lawns to mow, we still endure everyday trials of life…. 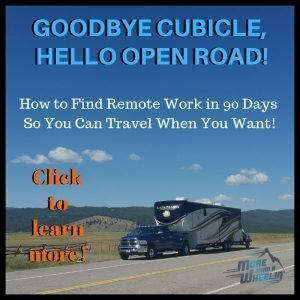 Just because we live in an RV doesn’t devoid us from the same stuff we used to; still emphasizing that we’re not in ‘vacation mode’. 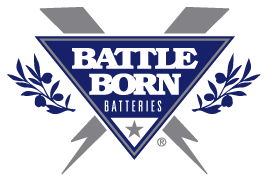 We still pay bills, have an immense amount of maintenance and upkeep to do, work, blog, network, help others, and yes, we also celebrate Christmas! 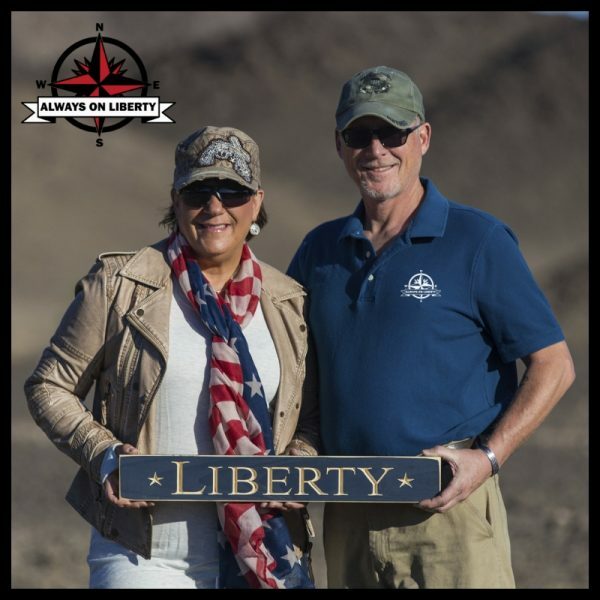 Back in early October, we moored Liberty at Wine Ridge RV Resort in Pahrump, Nevada for a couple months. 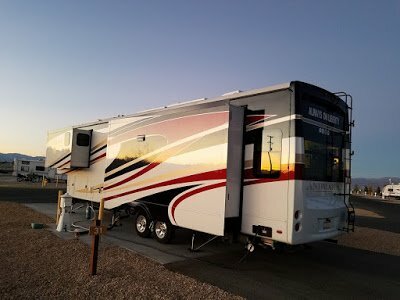 Normally, we don’t do more than a month anywhere however, we needed a comfortable place and time to get started on our RV mods project and to unload a few things. 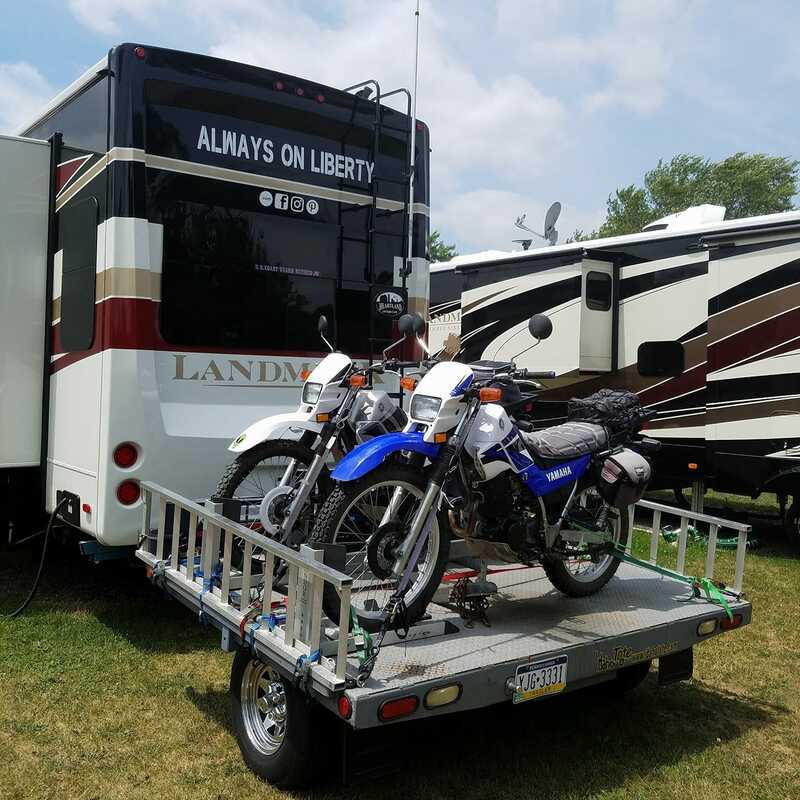 Only a couple days after arriving, we sold our two Yamaha XT225 Adventure motorcycles. As much as it pained us to sell them, it was for the best; for our safety most of all. We just aren’t as young as we used to be and we found that it was getting harder to find trails to use them as they were meant to be used. We also sold our Idaho Tote to another RVer who coincidentally, was parked at Wine Ridge not too long after. We’re sad to see it all go but we’re looking into different, ‘more safer’ options of recreation when we moor Liberty. 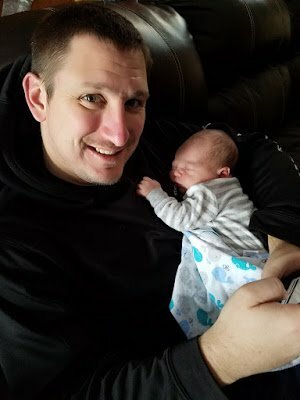 A week after hooking up to shore ties, I flew from Las Vegas to Minneapolis for a week to help co-host our son and daughter-in-law’s baby shower. While I was tending family obligations, Dan started overhauling the inside of RV’s living room and kitchen area. 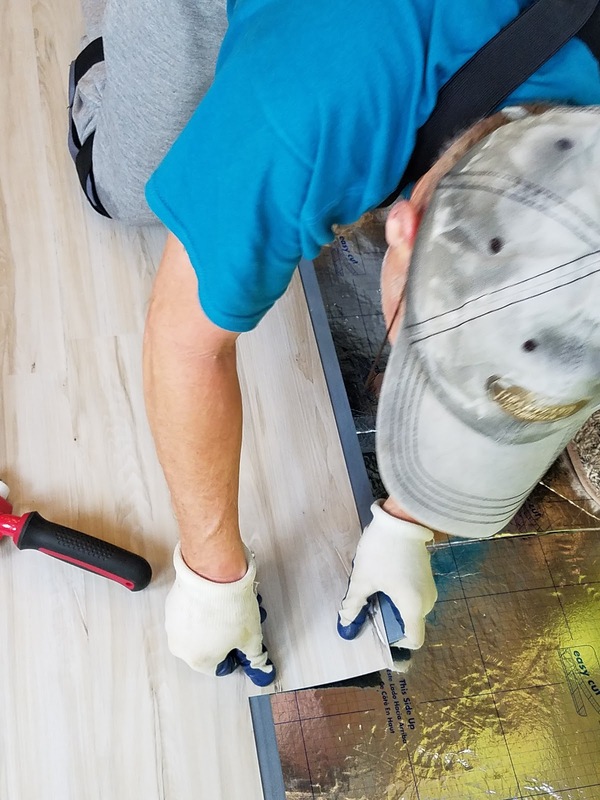 His first project was to caulk seams and edges, paint the ceiling, caulk more seams and edges, paint the slide walls, caulk MORE seams and edges and paint the rest of the wall surfaces. Did I mention he caulked…a lot? Once I got back, I was amazed at his painting perfection. It looked absolutely awesome! Without giving away too much (we will soon be posting our reveal), think ‘Key West Cottage’ for colors! A couple days after returning back to Liberty, we took down the cornice board window treatments and recovered those in colorful fabrics we picked out. We also changed our cabinet knobs, and did some other cool things. 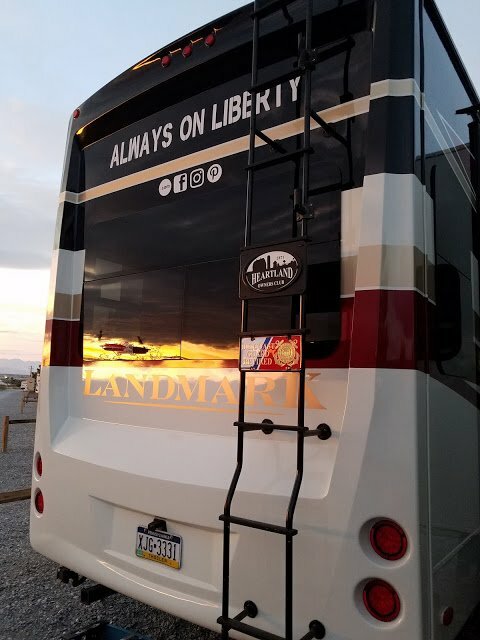 While we were in Pahrump, we met up with a Heartland Owners Club Chapter Rally that took place at another RV park. 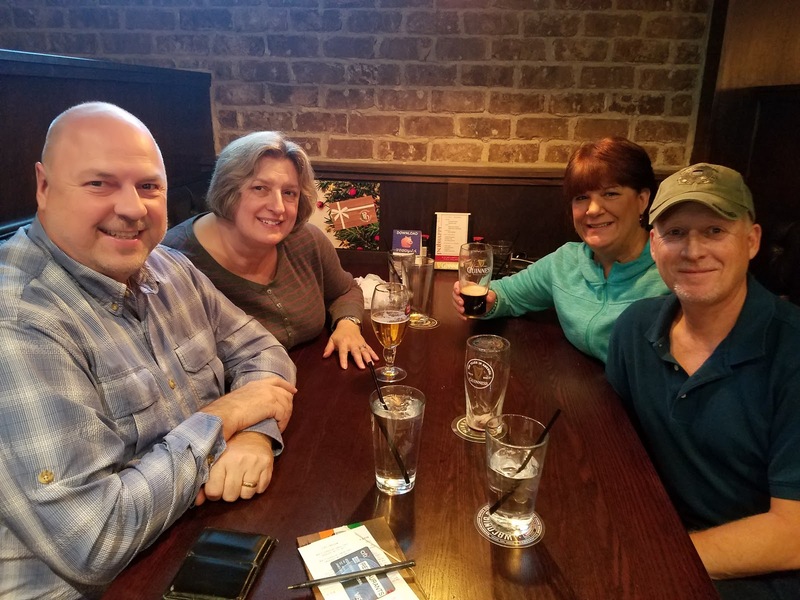 We enjoyed seeing some familiar faces and hung out. 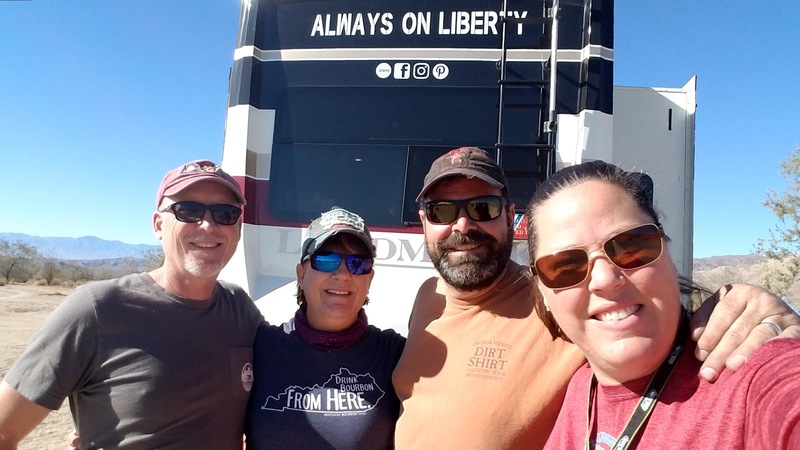 It was great to visit with our Heartland RV friends, OurSomedayIsNow Paul and Nancy. We had a little kitty health emergency shortly after my return from Minnesota. 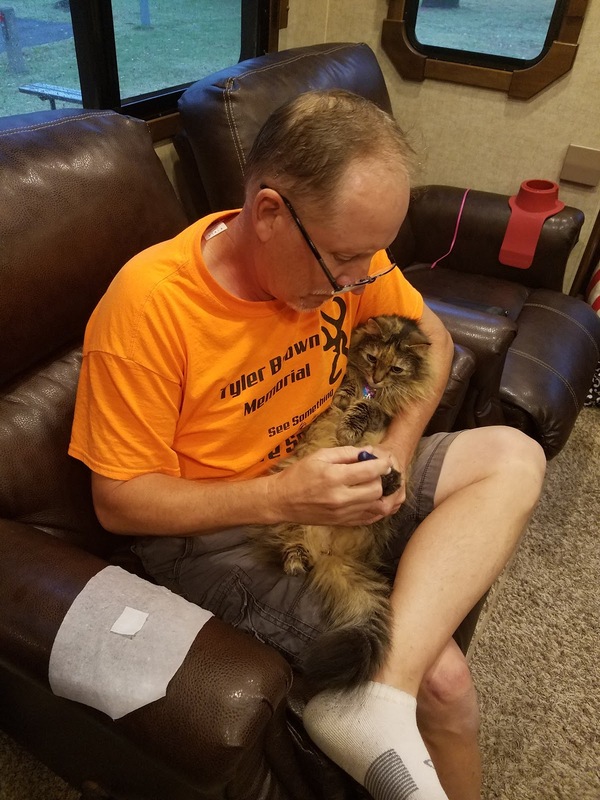 Those of you who have been following us prior, know that our feline crewmember and resident mouser, Krissie, was recently diagnosed with Feline Diabetes this past summer. Late one night, she had started acting strange; twitching, eyes lost luster, total confusion and meow-crying frantically. Krissie had a severe and almost fatal hypoglycemic episode caused from her blood glucose level dropping down to a scary 24. Because we had been educating ourselves on Feline Diabetes, we instantly knew what to do. I immediately rubbed corn syrup on her gums while Dan searched for an animal hospital emergency room. The closest was an hour away in Las Vegas. Dan drove as fast as he could with Krissie in her carrier on my lap while I monitored her every move. Once we got there, she was rushed in, put on glucose and then released to us when she showed signs of improvement and stability. However, a magical thing happened! 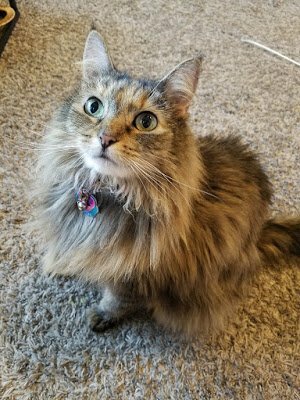 We don’t know how or why but she no longer exhibited signs of Feline Diabetes! She is now in remission! Her blood glucose is now normal and she’s eating, playing and being good ole Krissie again! She put on a couple pounds she lost due to the illness, her furry coat became fluffy, smooth and shiny again and her appetite was back to how it should be. Life for us, which had been changed due to her diabetes has come back to being normal again! Yay for all of us! 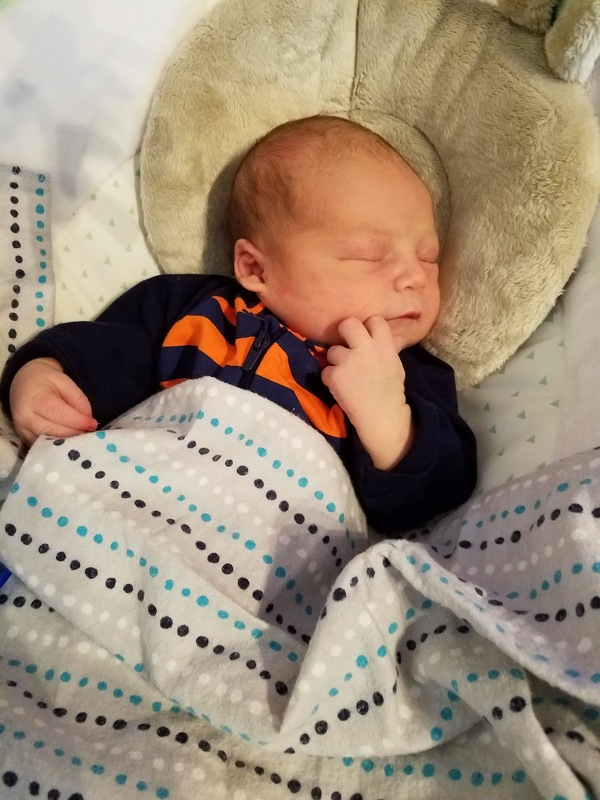 A couple weeks later, it was time to fly out again to Minnesota; this time, we went together to welcome our new little grandson, Declan, into the world. 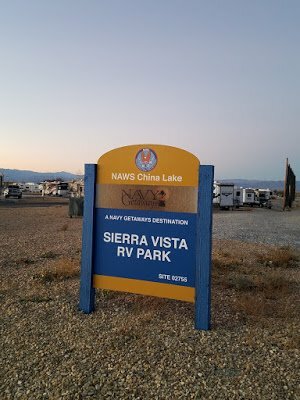 We hired a fellow RVer in the park to take care of Krissie and Kandi and look after Liberty during our absence. The day we arrived, our friends Jim and Nancy were in town visiting their own son’s family who lives only miles away from our son’s family, so we took in a little reunion lunch. We love these people. Their hearts are huge, they’re funny, and full of life. Oh, and Jim works for Heartland RV’s, so double bonus. We bounced things off of each other and enjoyed a good German lunch! We spent a quiet Thanksgiving with parents-to-be Dana and Kelsi while they enjoyed much needed sleep before Declan’s arrival. On November 28th, we were blessed with becoming ‘Memaw and Papa’! Declan had a bit of a rough entrance but once he was born, all of the tough stuff seemed to vanish (probably not so for mom and dad). 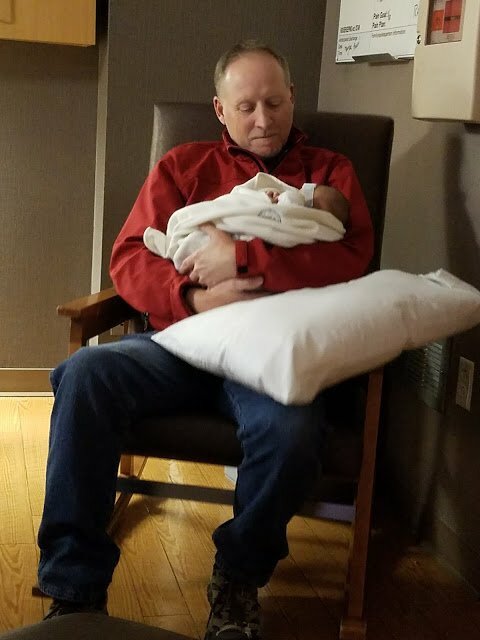 Now, for those who haven’t been privileged with becoming grandparents, understanding at this level is totally “indescribable” in a good way! 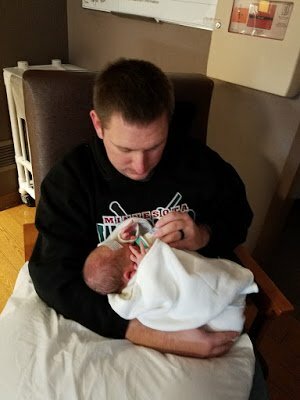 Seeing your own children hold their children is the most awesome to witness. Admittedly, even as I write this, looking at the photos makes me cry sweet happy tears. Aside from sleepless nights, they perfectly meshed into their new role as parents. 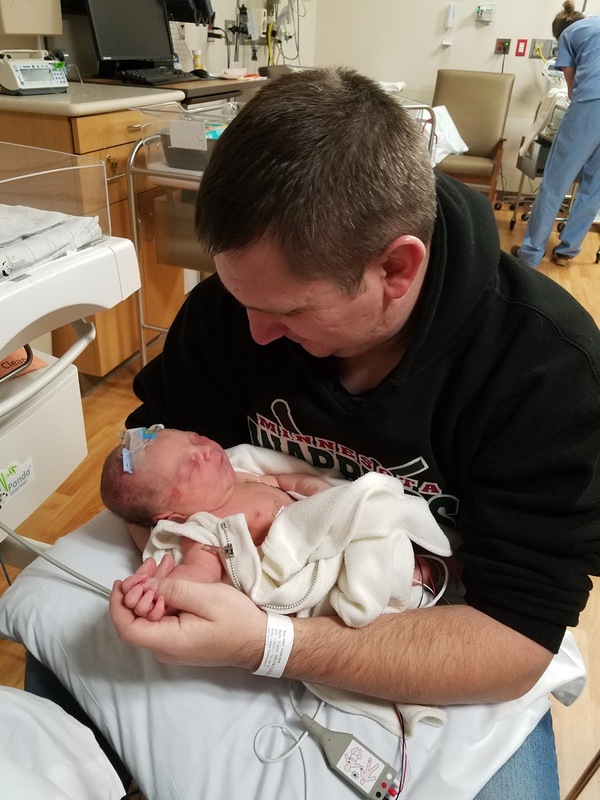 A couple days after Declan was born, Dan flew back to Liberty by himself because I needed to stay behind to help the new parents with transitioning home as a new family while Kelsi’s parents had to step out of town for a family emergency in Colorado. I flew back to Las Vegas the day after they returned back to Minnesota. 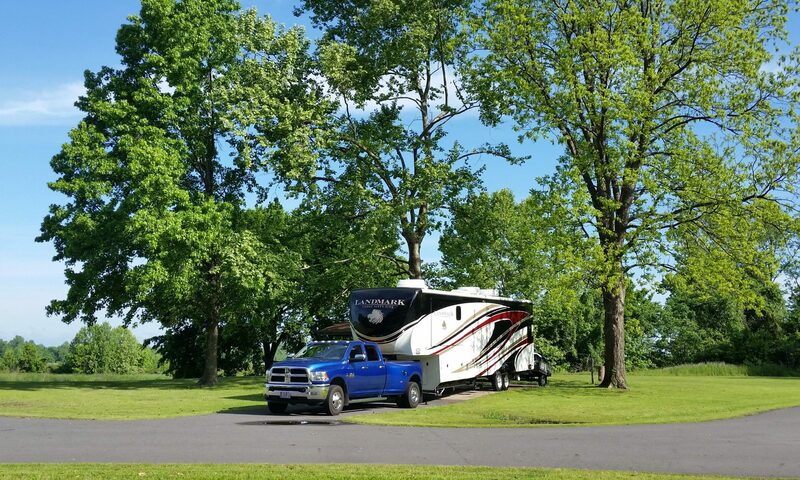 We ended up staying an additional two weeks at Wine Ridge RV Resort, but we didn’t mind as it’s one of our favorite places to park (hooked up). Once I got back, Dan laid our new flooring in Liberty while I went to take care of a day of errands in Vegas. Dan chased me out for the day because admittedly, I have this bit of perfection and being a bit bossy and well, when it comes to big projects like this, ‘sometimes’ our existence together ends up being like a family night of playing Monopoly with game pieces flying everywhere out of displeasure and pissyness. But hey, we all have our hang ups, right? Needless to say, the new flooring looks awesome and we’re still married! More later in our reveal posting. Before leaving Pahrump, our Heartland Landmark and Xscaper friends, David and Cheryl of Landmark Adventures pulled in for a few days. We took a day trip to Shoshone, enjoyed great fine dining with them at the winery, celebrated their Hanukkah with them and took a chance at eating at a Thai restaurant; a first for us. 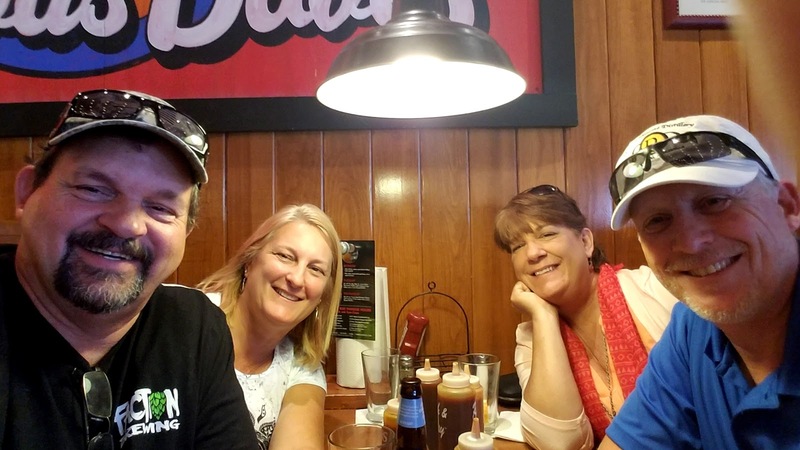 Like all of our RV family and friends, we never say ‘goodbye’ as we know we’ll see them down the road sooner than later and for David and Cheryl, it was sooner as we would be meeting again in Quartzsite in January (where we are now as I post this). Mid December, it was time to get on down the highway. 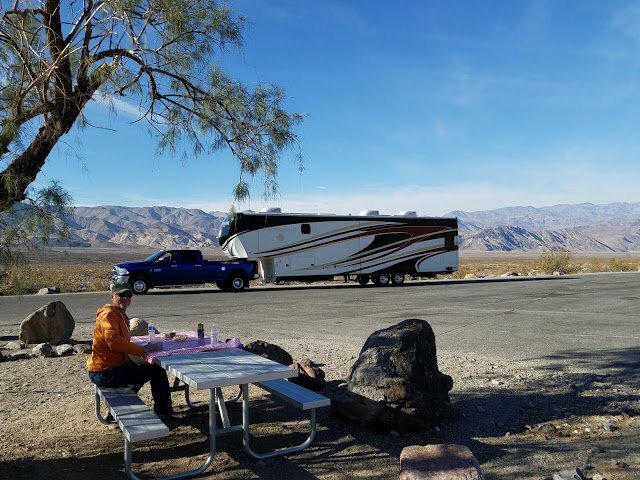 We decided to take the road through Death Valley National Park however, now we know why few take it because there’s a portion of the road that is through the mountain pass of steep grade (9 ½%) and switchbacks which made our travels a nail biter and white knuckled. However, we made it and got some glorious views. Our planned destination for Christmas to boondock at Trona Pinnacles. We got to China Lake Naval Air and Weapons Station for an overnight of loading extra stores and topping off our water, propane and emptying tanks. While Liberty was parked, we drove out to Trona Pinnacles to scope out where we wanted to anchor down for a week to ten days. There’s a saying, ‘Want to see God laugh, tell him your plans’. That evening when we settled in for the night, we turned on the local news and weather only to find out that there was a unfavorable weather pattern aiming right straight to the Pinnacles. They were calling for high winds and temperatures to dip into the low teens. Now, for some of you, that doesn’t amount to a hill of beans however, for us who live in RV’s, freezing pipes will spell disaster and tons of money for repairs. So, that was a ‘no way, no how’! We would post photos but we’re going to save that for our next visit. So, we pulled out our atlas and looked at our geographical options of dodging this cold front…which was plaguing the entire Southwest United States anyways. We decided to hook up, pull up our levelers and head to boondock near Joshua Tree National Park which was to be our next destination anyways so, we just got there a little sooner than planned. 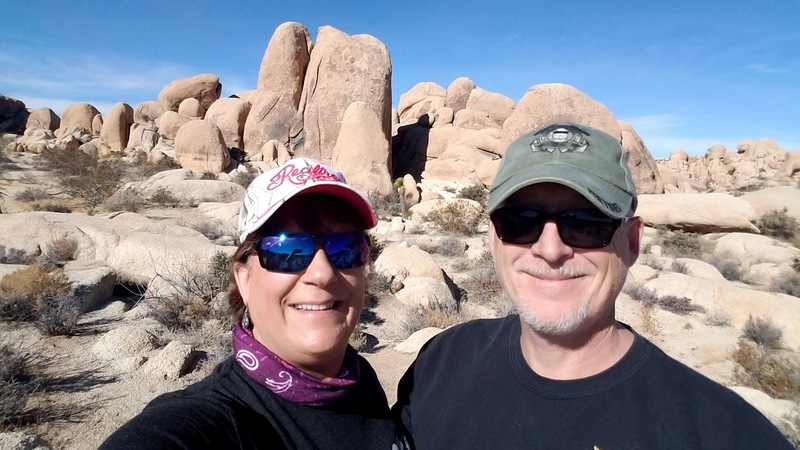 Our visit was interrupted with I getting hit with a nasty bout of Vertigo which landed me in the Emergency Room at Twentynine Palms Marine Corps Base. I received stellar care there and was sent home with a fist full of Meclizine, ordered to rest a couple days and learned how to control it through physical therapy measures. Two days later, I was back to my old self again and ready to take on some hiking and boulder climbing, so we set off to visit Joshua Tree National Park in California. We were absolutely in love with all the different offerings Joshua Tree posed to us. We learned about the different plant and tree life as well as the starkness of anything ‘living’ there. The topography differences really piqued our interest as well. We hope you enjoy our blog post ‘Christmas in the Joshuas’. 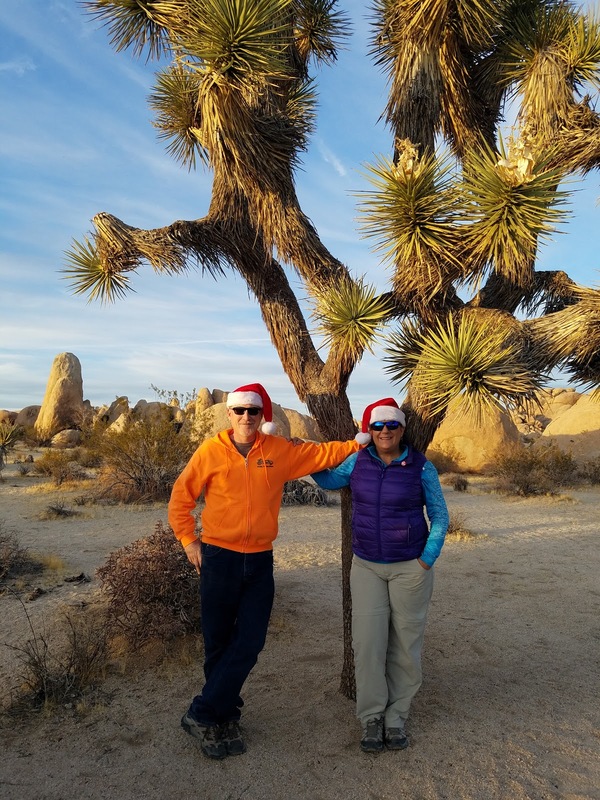 While we were there, our friends Gary and Stacy from Pau Hana Travels decided to come and celebrate a quiet Christmas with us in the desert outside Joshua Tree in their motorhome. We did a couple outings with them to the Park as well. A couple days after Christmas, they left and we were sad and lonely. 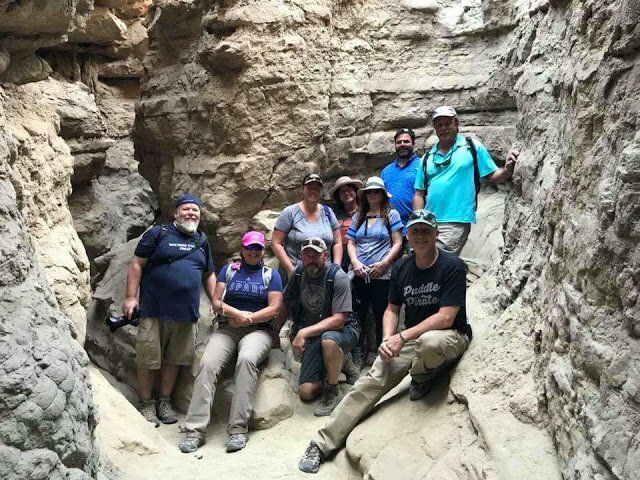 We texted them to come back but instead, they invited us to pull up anchor and head to where they were at Anza Borrego State Park near Borrego Springs, California. OH! It didn’t take but a few seconds to oblige. 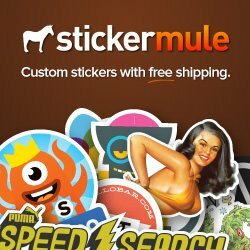 We had to wait for an Amazon shipment we were expecting in nearby Indio but told them that once we got it, we were on our way. While waiting for it, the next day, we took a quick side trip to Salton Sea and the coastal communities nearby. 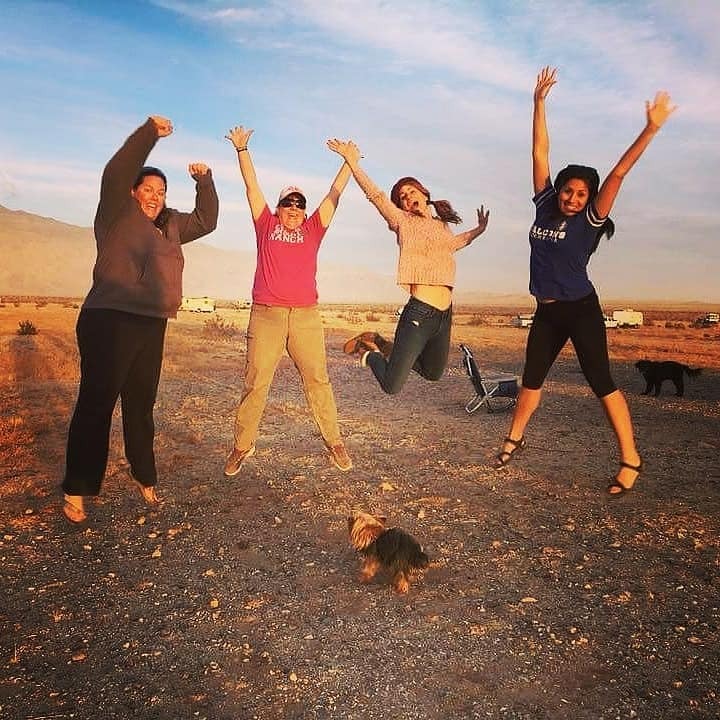 You can read about our Brush with Death Experience at Salton Sea. Go ahead! I give you permission to laugh at my expense! 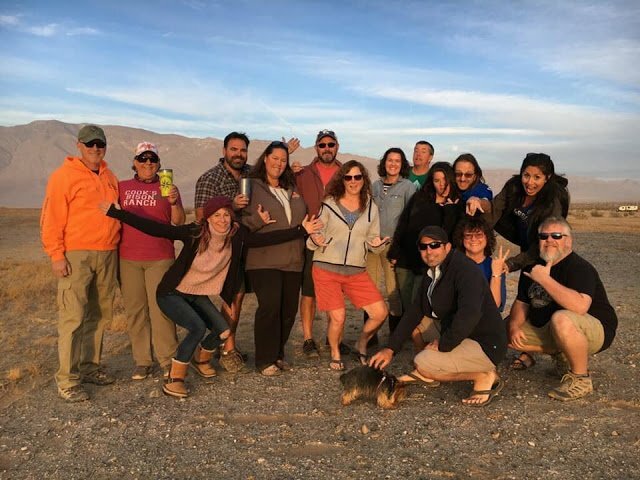 Anyway, once Dan picked up our Amazon shipment, we immediately relocated to be with our friends from Pau Hana Travels at Anza Borrego. 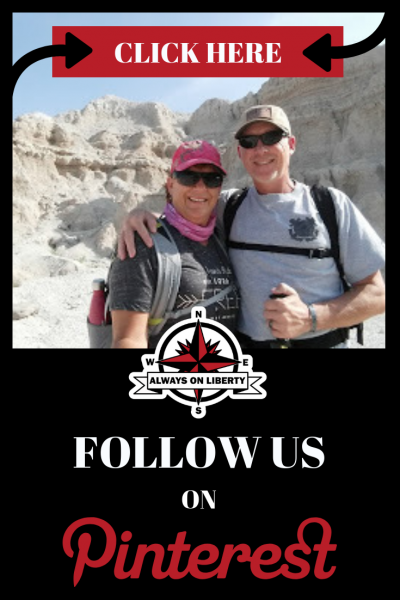 We were met with smiles and hugs from familiar faces; Trinkles On Tour Bill and Porter, RV Chickadee Kelly Beasley and RV Outlawz Denny and Veronica. We also finally met American Landlopers Anya and Kirk, and Away We Winnebago Scott and Jamie. Oh, and our friends More Than a Wheelin Camille and Bryce came for an overnight visit to ring in the new year with all of us! Together we celebrated ringing in 2018 with Denny’s Dance Party and enjoyed ‘Meat Madness’ potluck dinner where most everyone brought a meat of some type; either bbq’d, baked, broiled, steamed, etc. Other than Porter’s awesome coleslaw and family recipe BBQ sauce, I don’t recollect any vegetable being on that table! Oh! 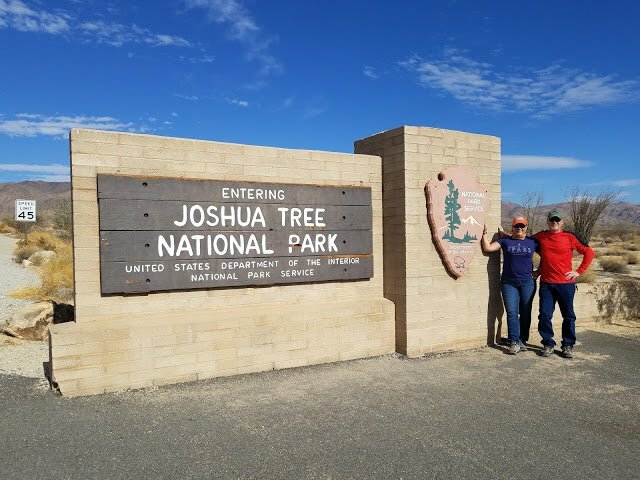 Let me add, the outside temperatures were absolutely HEAVEN SENT, especially after our disappointment of not being able to boondock at Trona Pinnacles. Most of us took in a couple hiking excursions. Our first experience hiking a slot canyon was the absolute bomb! It was fun, challenging and exhilarating once we hiked to the top of the canyon. We can now say that we truly ‘found our tribe’ after over three years on the road. And that’s where we are now. It’s 2018 and we’re darn excited about what lies ahead, people we’re going to see and the places we’re going to! 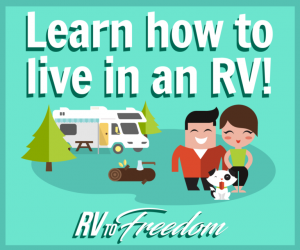 We still love our RV Life! We wish all of our followers, family and friends the BEST in their 2018! We pray for happiness, good health, and the stars align in your favor. Great to ring in the New Year with you guys. Sounds like you've had an interesting and exciting year! 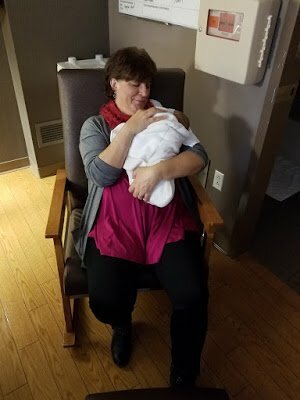 Congratulations on your new grand-baby! 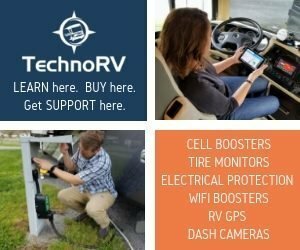 Awesome recap of what you've been up to! Really looking forward to your reveal post on all of your marvelous re-do's.